Energy you can trust Add more reliable power to your Samsung S5. Our engineers meticulously designed the battery cells to ensure the highest level of safety and performance for your phone. Ultra-Slim Profile The super-light weight external battery case was constructed with quality materials to ensure optimum performance. Easily track your battery life. Four LED lights to indicate the power remaining helps let you know when to juice up. Never be a wall hugger again. Anytime, anywhere. With the kickstand installed in the back of your phone, you can kick up your feet and watch as many videos as you want, wherever you want. Dual purpose S5 case allows you to protect and extend the battery of your phone at the same time. This high capacity power pack adds an additional 3800mAh of raw energy to satisfy even the most aggressive phone users. Ultra-light weight external battery case was constructed with quality materials to ensure optimum performance. 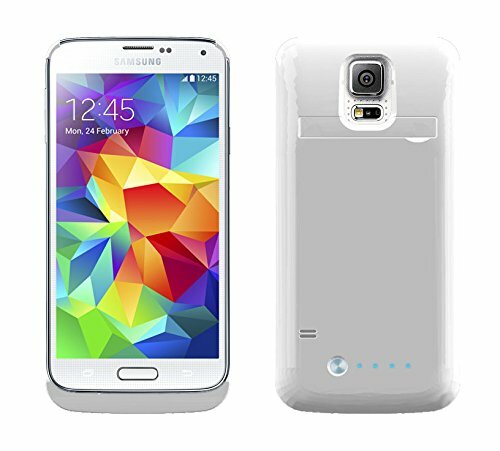 Featuring an elegant pearl white glossy finish, The MOTA Extended Battery Case for Samsung S5 utilizes premium battery cells to provides you with the highest level of safety and performance at all times. If you have any questions about this product by TAMO, contact us by completing and submitting the form below. If you are looking for a specif part number, please include it with your message.